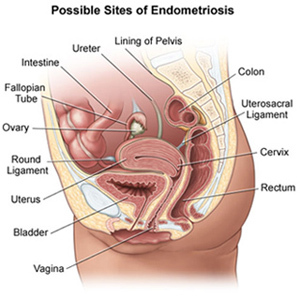 The stage of the endometriosis does not necessarily indicate the risk of infertility, the presence of other symptoms or how much pain a patient will experience. For example, it is possible for a woman in Stage I to be in tremendous pain, while a woman in Stage IV may have no symptoms. In addition, women with impaired fertility who receive treatment during the first two stages of the disease have the greatest chance of regaining their ability to become pregnant following treatment.